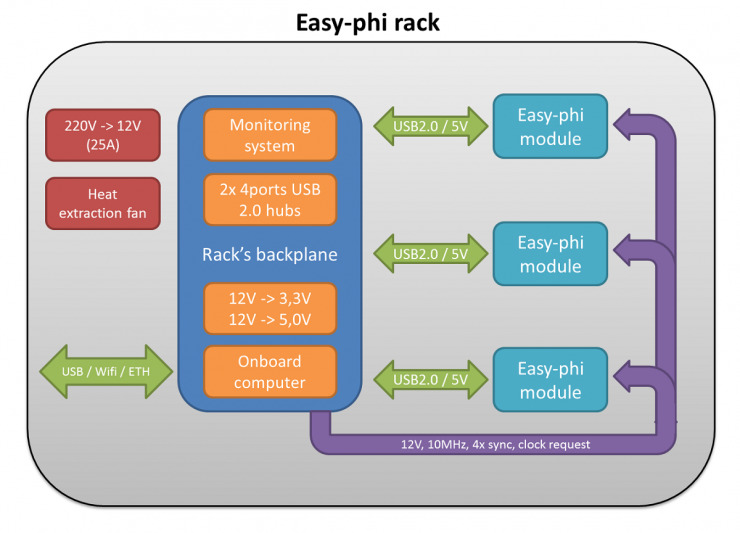 Two versions of the rack are currently available: with 5 or 16 slots, with other versions to come. The back-plane contains an embedded PC: http://cubieboard.org/ that connects to all modules with USB (2.0) links. It also powers up all the modules and provides an ethernet or Wifi link to configure them. The rack sends a 10MHz differential reference clock signal to all modules, which can be overridden if a dedicated control signal is enabled (like GPS or OCXO clock). There are also 4 bi-directional synchronization signals which are common to all modules, pulled up to 3.3V by 2k resistors. The frame is powered by one 12V power supply and two step-downs on the backplane generate the +5V (3A) and +3.3V (1A). A monitoring system based on the ATMega32u4 checks the signal states, voltages, backplane temperature and 12V current consumption. 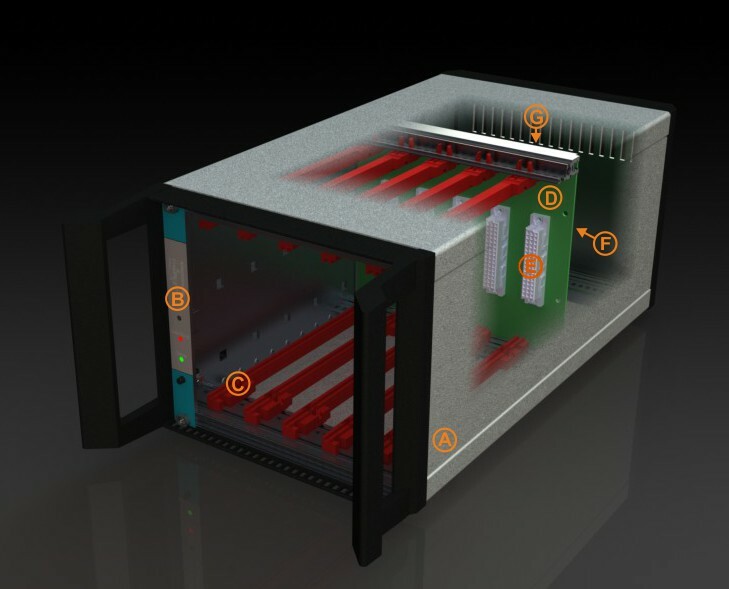 The microcontroller enumerates as a virtual COM port so the Cubieboard can request the rack state at anytime. This system is using +5V generated from a LDO connected to the 12V. The ATMega is connected to two LEDs to visually check the presence of 5V and 3.3V in case the system becomes unresponsive. Each 5V provided to the modules is controlled by current-limited, power-distribution switches connected to the USB hubs. If one module's 5V current consumption exceeds 0.5A, the module will automatically be disconnected from the USB bus. To avoid obsolescence, signals between one module and the back-plane only consist in 4 synchronization signals & one 10MHz clock (common to all connected modules), one individual USB (480Mbits/s) connection, +5V (0.5A) and +12V (4A). The module is designed to be hot-plugged. All data signals are located at the center of the module's connector while the ground is at its periphery. This ensures that the first electrical contact made when plugging the module is the 0V. All signals are obviously ESD protected.